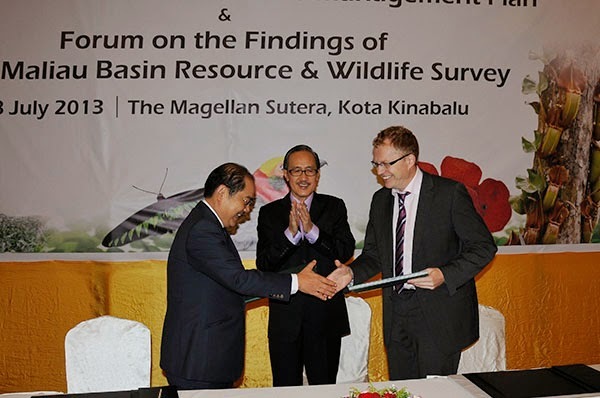 A Memorandum of Understanding (MoU) on the “Revision of Maliau Basin Conservation Area Management Plan” was signed between Yayasan Sabah and Nature, Ecology & People Consult (NEPCon) of Denmark, recently. The MoU aims to examine and update the Maliau Basin Conservation Area Strategic Management Plan for year 2014 - 2023. The MoU shows the interest and dedication in ensuring the protection and conservation of Sabah’s natural heritage. NEPCon was one of the consulting firms appointed under the four-year collaborative project (1999-2002) between Yayasan Sabah and DANCED (Danish Cooperation for Environment & Development)/DANIDA (Danish International Development Assistance) to provide technical assistance. NEPCon is in the effort to promote sustainable forest and nature management and use by working towards to encourage the use of natural resources worldwide in sustainable ways. Through this joint-project, they have formulated the first Strategic Management Plan for Maliau Basin Conservation Area 2003-2012. The completion of the Maliau Basin Studies Centre and related infrastructures and facilities is one of the success that has been achieved besides seeing a lot of developments and changes in the Maliau Basin Conservation Area. With the success of the first Strategic Management Plan for Maliau Basin, NEPCon has been invited once again to examine and update the Management Plan for year 2014-2023. In the signing ceremony, Yayasan Sabah was represented by Datuk Peter Pang En Yin while NEPCon was represented by its director Peter Feilberg, and witnessed by Tourism, Culture & Environment Minister, Datuk Masidi Manjun.